Craft-E-Family has been making wooden perpetual calendars for more than 30 years. This is our first Contemporary version. 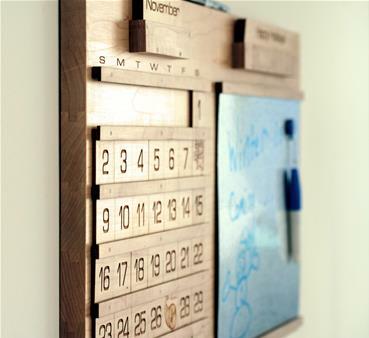 For years we have wanted a modern calendar for our own home, and we finally decided to create one this year. We also wanted to keep the calendar as natural as possible. The month and day tiles are laser cut and engraved from repurposed maple we salvaged from our personalized block production. The rails and tile holders (also repurposed maple) are mounted to the calendar with dowels. Our new calendars are handcrafted with precision. It has been a great experience designing and crafting these calendars and we hope you enjoy yours for many years. Handcrafted with maple by Craft-E-Family in Mooresville, Indiana. 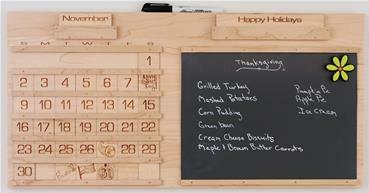 Includes magnetic dry/erase board and chalkboard. Front side of board is galvanized metal for use with dry/erase markers and wet-erase chalk. Back side of board is for use with chalk and wet-erase chalk. 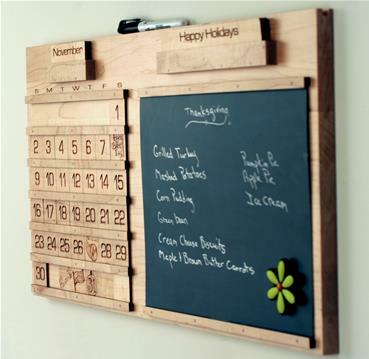 Store your chalk and markers on the top of the perpetual calendar. Includes tiles for the months. Unused months are conveniently stored behind current month. 2 Personalized tiles are also included. They are displayed and stored over the chalkboard. The phrases are: Happy Birthday, Vacation, Welcome, Happy Holidays, Enjoy Today, Live, Love, Laugh, ❤ Love ❤, and the final one will be The (your last name here) Family. A 3rd personalized tile is also included that can be customized by you with chalk or wet-chalk. Also comes with the following holiday tiles featuring our custom artwork: New Years, Valentines Day, St. Patrick's Day, Easter, Memorial Day, 4th of July, Labor Day, Halloween, Thanksgiving, Christmas, Birthday. Our modern calendar is 12" tall and 24" wide. Hanging our modern perpetual calendar is easy. Keyholes are on the back of the calendar. We include screws and drywall anchors.